Given the identical naming of Numbers (for iPad) with Numbers (in iWork ‘09), you may be expecting the iPad version of Numbers to be a clone of its desktop counterpart. If that’s how you approach Numbers for iPad, though, you’re bound to be disappointed. While replicating many of the features of the desktop version, Numbers for iPad is a ground-up rewrite focused on creating and working with spreadsheets directly on the iPad. As such, it’s essentially a completely different product than is Numbers for Mac OS X. While it’s a bit unusual to start a review with a discussion of what a program can’t do, I think it’s important in this case: if you’re contemplating buying Numbers primarily for moving spreadsheets back and forth between Mac and iPad, while modifying them on the iPad, you need to be aware of some key limitations in Numbers for iPad. The biggest limitation is that, unlike its desktop namesake, you cannot export from Numbers in Excel format; the only options are PDF or Numbers. If you were planning on using Numbers for iPad to work on spreadsheets before sending them off to your Excel-using coworkers, you’ll need to make other plans. Also, font support on Numbers for iPad is limited to the 40-ish fonts available on the iPad; you can’t import fonts with your spreadsheet, and Numbers will substitute any fonts that don’t exist with ones that do. A few Numbers for Mac features are missing as well: You can’t use merged cells, pop-ups, steppers, sliders, or conditional formatting (and probably a number of other minor features). 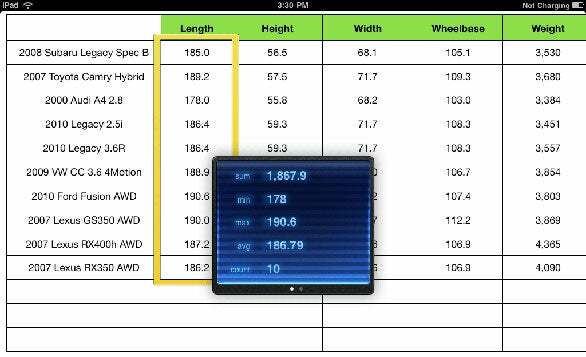 As a result, you may find you have to rework the formatting of spreadsheets that you move onto the iPad. With all those limitations, you must be thinking that Numbers for iPad is an awful program. The surprising thing is that it’s not—the limitations I mentioned mainly relate to working with spreadsheets from Numbers (or Excel) from your Mac on your iPad. If you’re using Numbers on the iPad for creating new spreadsheets, however, the program is well suited to that task, with a few caveats. 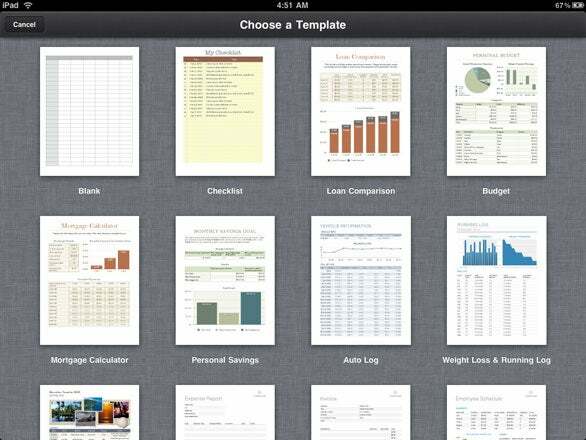 Numbers opens to a spreadsheet browser, which shows all of the spreadsheets on your iPad. You can have as many as you’d like, until you run out of RAM on your iPad. You flip through your sheets with a finger flick, and each screen contains a preview of the sheet, its name, and a last modified timestamp. The spreadsheet browser is also where you share your spreadsheets; you can send them via Mail, share via iWork.com, or export to Numbers or PDF format. Once exported, you can access a spreadsheet on the Apps tab in iTunes (once your iPad is connected to your Mac) to transfer to your Mac or Windows machine. Choose a Template: Numbers for iPad includes 15 designs so you can quickly get started on data collection. A prominent New Spreadsheet button brings up Numbers’ template chooser, where you’ll find 15 new templates designed to focus on expected uses of Numbers on the iPad. For example, there’s a simple checklist template, a loan comparison template (so you can make sense of the myriad offers that a car dealer will show you), an auto log for tracking car mileage and maintenance, a team organization template for coaches-to-be, and some templates targeted at educational use (GPA tracking, a stats lab, and an attendance form). Once in Numbers itself, the interface is easy to understand. Tabs along the top of the screen show each sheet in your spreadsheet; you can flick the tabs to see tabs that are presently offscreen. Above the tabs, a minimalist toolbar contains buttons that return you to the spreadsheet browser; undo (or redo) your last 200 actions, even after you close a spreadsheet; format items; insert new media, tables, charts, or shapes on the present sheet; and that find text in your spreadsheet, view help, and check spelling. Pop Up: In full-screen mode, a floating window appears when you select a range of cells. The last button in the toolbar toggles Numbers into full-screen mode, which provides an interface-free view of your worksheet. You can’t do much of anything in full-screen mode, with one exception: you can select a cell, or range of cells, and Numbers will then display a floating window with some basic stats about your selection, including sum, minimum and maximum, average, and count. If you flick this small floating window once, you’ll see a graph of the selected cells. One of the first things I noticed was that the interface has been totally rethought for touch. For instance, tapping a cell in a table selects it, as you’d expect. Tap the vertical or horizontal bar that appears above a table after selecting a cell, however, and you’ll select the entire column (or row). Once selected, you can resize the column by dragging a small resize widget in the header of the selected area, move the column by dragging anywhere else in the header area, or select more cells by dragging a blue dot on the edge of the selection frame. You can resize one object to match that of another by beginning your resize drag, and then tapping the other object with another finger; Numbers will instantly match the size of the select object. There are many other nice touch-related features, and they’re well worth reading about in Numbers’ help. Unfortunately, you’ll have to have your iPad on the Internet to read Numbers’ help—it’s not available from within the program. Instead, Safari launches when you tap the Go to Help button in Numbers. For a device that’s intended to be used in the field, where net connectivity may be non-existent, this seems like a bad design decision. 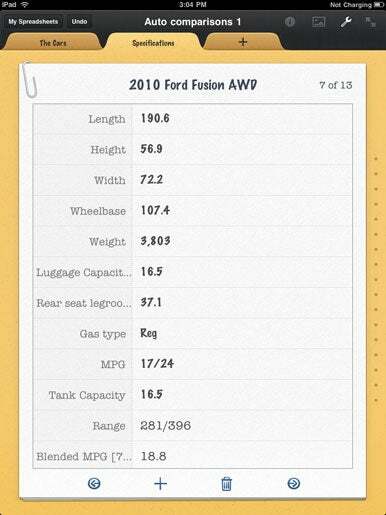 As with its desktop cousin, Numbers for iPad supports multiple objects per worksheet. You can easily add photos, tables, charts, and objects to a sheet. There are multiple versions of tables, charts, and objects to choose from, and you can easily customize your selection. Add a shape, for example, and you can then change its fill color and opacity; border color, style and thickness; and type of shadow (or no shadow). This degree of control makes it possible to create some very nice looking spreadsheets, as a quick tour of the provided templates will show. Data Entry: A keyboard appears when you need to input data. The first tap on a cell in Numbers selects that cell; a double-tap brings up the cell editor, where you can enter text, date and time values, figures, or functions (over 250 functions). Each of these input modes has its own customized keyboard, greatly easing the data input task. I did have a couple quirks where input I had typed didn’t seem to be accepted; tapping Done, which should add it to the cell, didn’t seem to work. Instead, if I tapped the ‘hide keyboard’ button, the text was accepted. This didn’t happen regularly, though, so I’m not sure what caused it. Cells in tables can be formatted in a number of ways, including a star rating format (zero to five stars) that you won’t find in the desktop version of Numbers. As noted earlier, though, you won’t find steppers, sliders, or pop-up menus in Numbers for iPad. Still, for its intended use, there’s a good amount of control over the appearance and behavior of cells. I did find the cell border tool to be difficult to use in Numbers for iPad, primarily because it won’t let you set multiple borders (left, right, and bottom, but not top). Also, when deleting a cell’s contents, the border was also erased, forcing me to create it again after I edited the cell. Forms are a new feature in Numbers for iPad, designed to make it easier to enter data into your spreadsheet. To use Forms, you first design your table (or tables) as you wish them to be, and then tap the plus sign on the tab bar. A pop-up lets you choose a new form or new sheet; choose a form, and you’ll see a page that shows all the tables on all your sheets. Select one table from that list, and a form is instantly created from that table. Forms: Another way to view your data. What is a form, exactly? A form is really nothing more than a different view of an existing table on a sheet. For instance, if you create a form from a six-row, seven-column table, the resulting form will contain six separate “pages” that you can flip through. The title of each page will be taken from the first column in the selected table, and below that, the remaining (in this example) six columns will be shown as six single-line inputs. At the bottom of the form, arrow buttons let you flip between each “page,” as well as add or delete “pages,” which are the rows from the table. If you delete a “page,” you’ll delete the corresponding row from the original table. That’s because the form is directly linked to the table you selected when you created it--any changes made on the form are instantly reflected on the associated table. The big advantage to this method is that it’s much simpler to enter data using a form than it is to try to tap into each cell in the original worksheet. One downside of forms is that they won’t survive a roundtrip to and from your Mac—if you export a worksheet to your Mac, edit it there, and reimport it to your iPad, any forms you created will be gone. The good news is that recreating a form takes only a couple of taps, so it’s not a huge amount of lost time. In my time with Numbers, it performed quite well when I was creating new spreadsheets directly on the device. While it takes a while to adjust to the touch interface, it does eventually begin to feel quite natural, and Apple has done a reasonably good job at putting often-used functions only a tap or two away. Where Numbers falls short is in trying to serve as an intermediary for working on Numbers (or Excel) files from your Mac. While Numbers replicates most of the functions of the desktop version, the missing formatting options will usually result in required rework, and will become quite frustrating if you have to go back-and-forth regularly. The inability to save files in Excel format also limits its usefulness for Excel users: only those users who don’t care if they lose the Excel format (or are content to convert it back to Excel format using Numbers on the Mac) will be satisfied with Numbers for iPad. The addition of forms and customized keyboards for data input eases that usually difficult task, and touch features abound in handling of both cells and objects. There is room for improvement in text handling, working with cell borders, and the help file should really be in the program itself, but this is a good first effort. 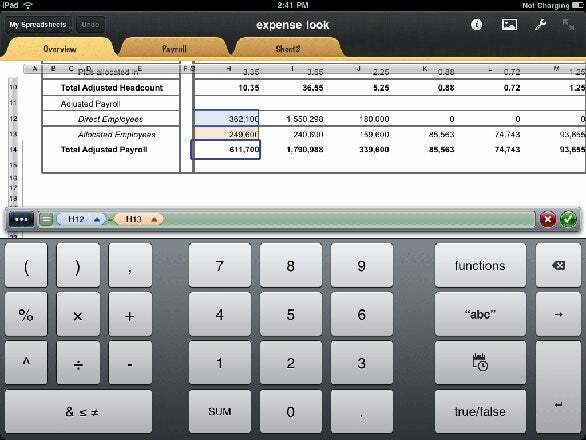 Taken for what it is (an incredibly feature-rich spreadsheet program running with a full touch interface on a 1.5 pound portable computing device) Numbers is a good start, and should meet the needs of most anyone looking to use their iPad to create and work with spreadsheets.